Club Carlson or Wyndham Rewards - Which Is the Better Value? Club Carlson or New Wyndham Rewards – Which Hotel Program Is Most Rewarding for Manufacturing Points? Yesterday Wyndham announced upcoming changes to their loyalty program. Frequent Miler covered the changes in detail, but the basics are that they are eliminating their award chart in exchange for an across the board 15,000 points per night at all of their properties. Wyndham has a number of low-end brands (Super 8, Travelodge, HoJo, Knights Inn & more), meaning that this immediately doesn’t seem like a great deal. The real benefit of this change is at their high-end properties. Another interesting aspect is that their all-inclusive resorts will only cost 15,000 points for two people as well. Does This Make Wyndham the Best? The changes announced yesterday excited a lot of people and I heard more than one comparison to Club Carlson in terms of value for manufacturing points. I just don’t see the comparison and I firmly believe that Club Carlson is the best overall value still. To backup my claims lets look at a few key areas. Since we are talking about manufacturing points, I will assume that points earned are with the co-branded credit card for each chain. Here is how each of the cards earns points on everyday spend. 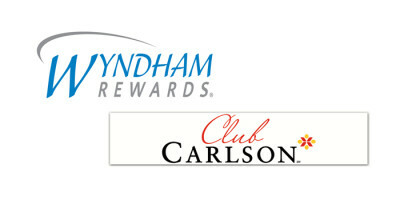 So the Club Carlson card earns points at a rate of 2.5x the Wyndham Rewards card. Super 8 Roswell New Mexico. (Photo from Wyndham website.) I stayed at this property in 2007. $50 a night or 15,000 points? Under Wyndham’s new program every property including that Knights Inn outside of Philadelphia that smelled like two week old curry and made me question why I was traveling will cost 15,000 points. Wyndham has a number of properties like that in their portfolio. Once those are eliminated, the amount of worthy hotels to stay at is dramatically lower. My best guess is that the company figures more people will redeem points at one of their low end properties, so they aren’t as worried about their costs of redemptions at the nicer ones. This is probably true since my experience has shown that “normal” people don’t look at the value of points redemptions like we do. On the flip side, Club Carlson is much better on the low-end. They have properties for as little as 9,000 points and even their category 3 properties costing 28,000 points work out to less than 15,000 per night if you factor in the credit card’s “Extra Bonus Night”. Carlson’s low-end brands like Country Inn are also significantly better than the Knights Inns of this world. Pool & Beach at the all-inclusive Viva Wyndham Maya in Playa Del Carmen, Mexico. I stayed there in 2007. So what about the top-tier properties in each program? With Wyndham they still cost only 15,000 points per night which is nice, but Club Carlson charges 70,000 points. Ouch! But lets take a closer look at what a two night stay would cost. Winner: Mixed, but if you are able to take advantage of the Extra Bonus Night, Club Carlson still wins out even on their highest costing property. Obviously with the lower level properties, the math favors Club Carlson even more. Overall Club Carlson is clearly the winner. Obviously the math changes without the Extra Bonus Night, but I always take advantage of that feature when staying at Club Carlson properties so this math works for me. If you don’t want to account for that bonus in the calculations, then Wyndham is doing better on the very high-end, but is still losing with the low and middle tier hotels. There are still a lot of unknowns about the new Wyndham Rewards program. In fact, we don’t even know if the credit card product will be revamped along with the changes to the award chart. My guess though is that if that happens, it won’t be for the better. Wyndham has been consumer unfriendly with their program changes before and my guess is this new redemption scheme is designed to significantly increase the price for their lower end properties. While travel hackers may be able to take advantage, the vast majority of program members will probably be paying more for their next redemption. Either way, I may pickup the Wyndham Rewards credit card, but it shall not replace Club Carlson in my overall strategy or in my heart. May the Extra Bonus Night live on forever! I’m not sure if I’ve read that all-inclusive stays w/ Wyndham will be 15K points. If so, we’ll be getting 2 cards. I’m waiting though, to see what this supposed best offer ever for the credit card will be. I’m w/ you Shawn concerning Club Carlson. I spent three weeks (2 trips) in Aruba in the last three months on points, and 14 of those nights were in $700 suites. Devil in the details: “Certain” all-inclusive properties. We shall see. I agree and I didn’t overlook that. They also use the term “participating properties” a lot as well. Doctor of Credit says they confirmed only two properties would be excluded at launch, so it seems to start pretty much the entire portfolio will be available. If I had to guess, the more popular and costly (to the company) redemptions will probably switch to become non-participating properties rather quickly. I received the following email today re: Club Carlson changes. As a valued Club CarlsonSM member and Club Carlson Visa® cardholder, we would like to tell you about an upcoming change to your Visa benefits.